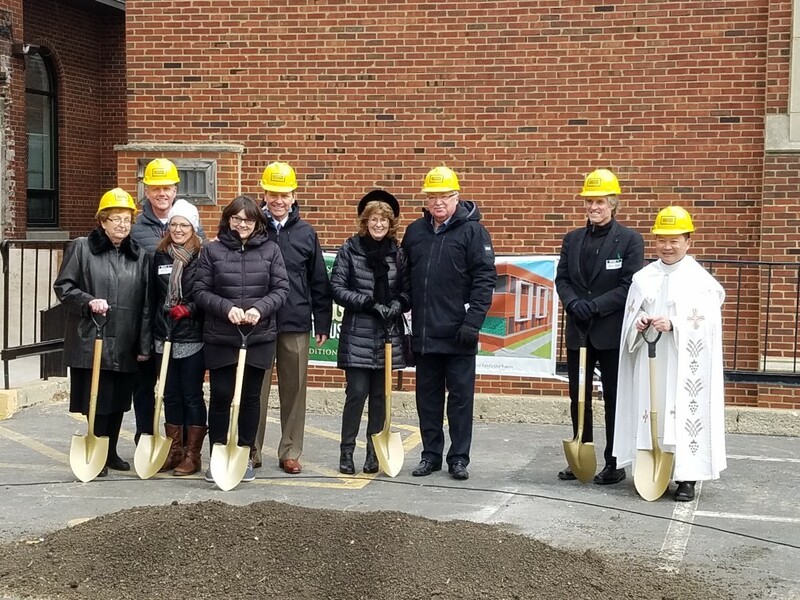 St. Joseph School put its motto of “Come Grow With Us” into action on Sunday, March 3 with a Groundbreaking Ceremony that celebrated the start of construction for the school’s first addition since 1955. 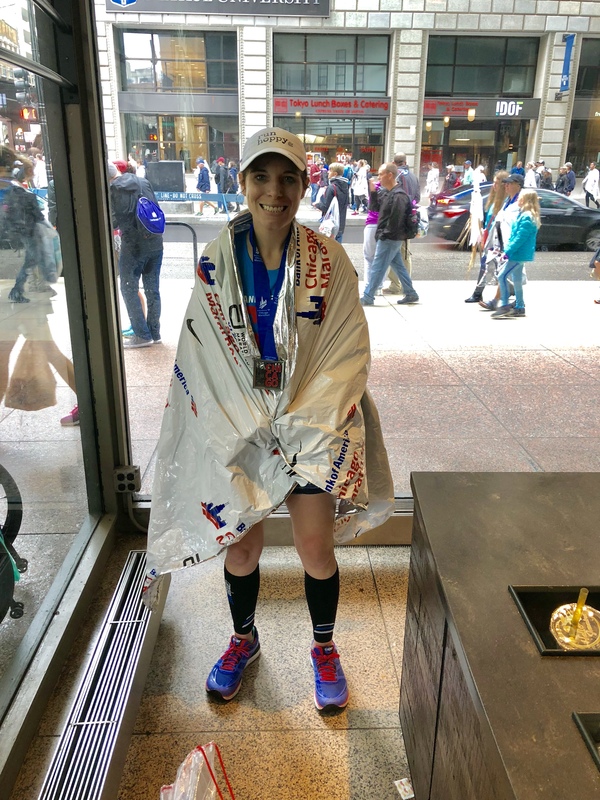 Congratulations to SJS Class of 2014 Alumna Maggie Dunn. We are so proud of her accomplishments which include National Merit Scholar, Illinois State Scholar, and National Honor Society member. We wish her the best as she starts her next chapter at the University of Alabama this Fall where she will study Civil Engineering. SJS Class of 2014 alumna Monica Oleski earned Valedictorian honors in her graduating class at Montini Catholic. She was recently awarded Academic All Star and received the President’s Award for Academic Excellence. 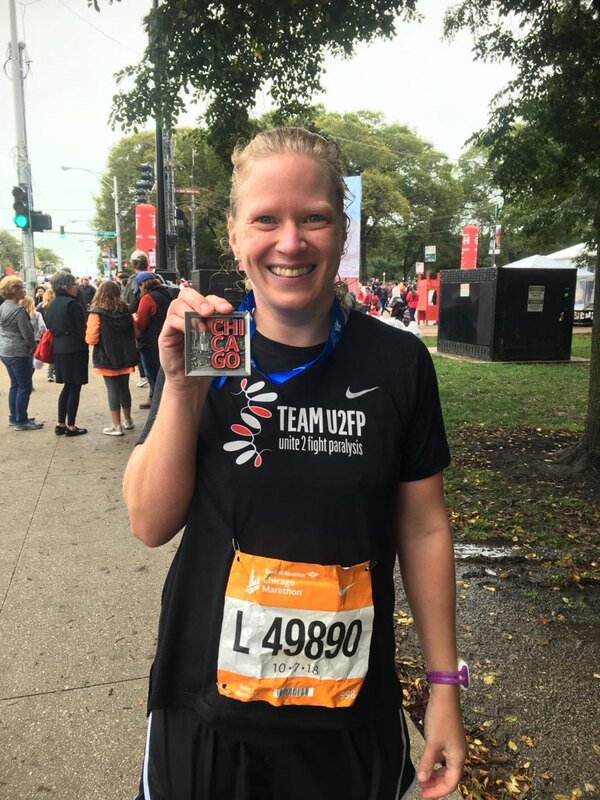 She is also an Illinois State Scholar, an AP Scholar, and was a member of Montini Catholic’s Mu Alpha Theta (Math Honor Society) and Math Team. She received Montini Catholic’s Silver Award for Excellence in both Math and English. 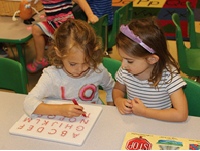 Research shows that music, art, foreign language, and physical education classes offer many benefits, including increased concentration and recall skills, enhanced communication skills, and better cooperation (team player) skills. Funding for these classes have been cut in approximately 80% of U.S. school districts in the past decade. 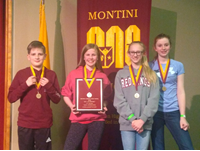 Eight SJS 7th graders competed in Montini’s “It’s Academic” Scholastic Bowl. 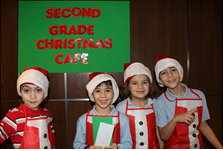 Twenty teams participated and answered questions in the areas of math, reading, science, social studies, and theology. Eamon Casey, Michael Gates, Luke Pacelli, and Joey Schamber did a great job showcasing their knowledge. 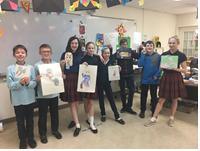 The other St. Joe’s team, Sadie Kearney, Josephine Rauch, Nathan Stevens, and Kadee Swanson won first place in the team competition! We also had two outstanding performances on the science individual competition: Joey Schamber, 3rd place, and Kadee Swanson, 2nd place. 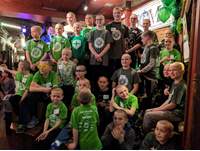 For the third year in a row, a team of St. Joseph students participated in a fundraiser for the St. Baldrick’s Foundation, an organization that raises funds for childhood cancer research. 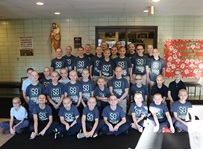 The St. Joseph team raised $12,821 (3-year total of about $36,000)! Students Tim Baer, Jack Kane, JT Schallmoser, Jack Chvatal, and Dean Golminas received certificates for participating 3+ years in a row. We are so proud of everyone who participated for such a great cause! SJS Student Artwork Wins "Best In Show"
SJS 7th grader Joey Schamber’s painting Winter Solace won “Best in Show” in the Downers Grove Women’s Club annual art contest. The contest was open to all Downers Grove 7th and 8th graders. The organization received over 40 entries in this year’s contest. 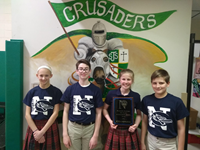 St. Joseph School took two 7th grade teams to the Nazareth Academy Scholastic Bowl. There were a total of 18 teams competing. The team with Danny Boyle, Michael Gates, Luke Pacelli, Joseph Schamber, and Michael Stangl competed in 3 rounds, making it to the top ten teams. The team with Eamon Casey, Josephine Rauch, Nathan Stevens, and Kadee Swanson went all 5 rounds and won the competition! 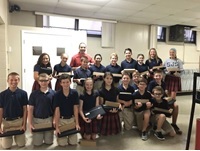 Thank you to the Knights of Columbus for sponsoring the annual essay contest for our 8th grade students about the importance of religious freedom. 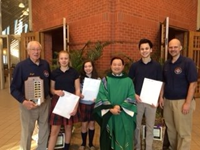 We recognized the winners, Saule Zemaitis (1st place), Adam Criter (2nd place), and Eileen Harris (3rd place), at the Catholic Schools Week mass. 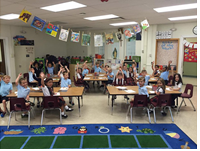 Service to others is inherent in Catholic values, and at St. Joseph School in Downers Grove, it is practiced consistently as part of a faith-based curriculum. 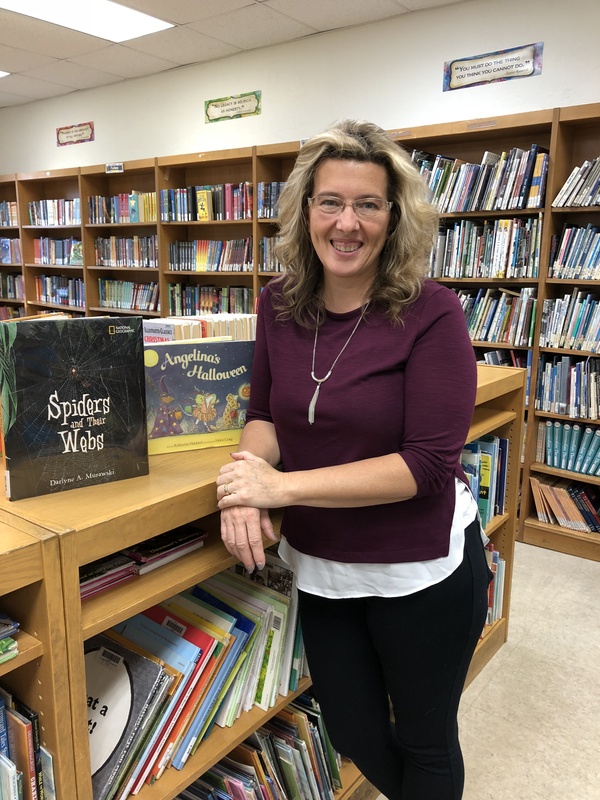 “We encourage our students to find ways to serve others, whether it’s helping a classmate, raising money for a charitable cause, collecting necessities for those in need, or working together to help our community,” said Rita Stasi, Principal of St. Joseph School.